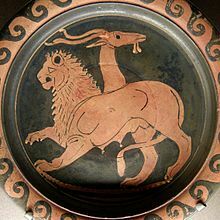 The Chimera (an aa Chimaera (Chimæra); Greek: Χίμαιρα, Chímaira) wis, accordin tae Greek meethology, a monstrous fire-braithin hybrid creature o Lycia in Asie Minor, componed o the pairts o mair nor ane ainimal. It is uisually depictit as a lion, wi the heid o a gait arisin frae its back, an a tail that micht end wi a snake's heid, an wis ane o the offspring o Typhon an Echidna an a sibling o such monsters as Cerberus an the Lernaean Hydra. This page wis last eeditit on 28 Mairch 2017, at 23:22.